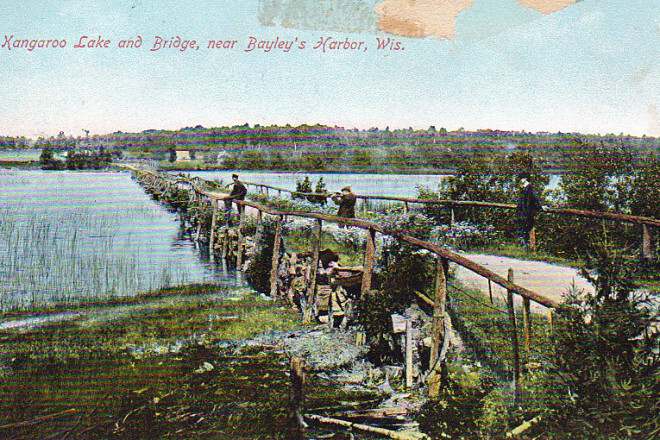 A postcard view of the bridge that preceded today’s causeway across Kangaroo Lake. Note the misspelling of Baileys Harbor as Bayley’s Harbor. Photo courtesy of the Door County Historical Museum, 18 N. 4th Ave., Sturgeon Bay. Open 10 am – 4:30 pm daily, May 1 through Oct. 31.